People around the state and country are working on projects to make roadways in their community safer for people and wildlife. We can learn from each of these projects as we begin work close to home on Highway 97. Department is retrofitting their existing highway system in multiple locations to increase safer passage for animals under the roadway. 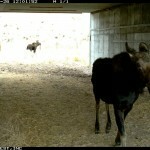 They have installed underpasses for wildlife at Nugget Canyon, Towgotee Pass, outside of Baggs, and Trappers Point. They have monitored the success of these underpasses capturing photos of animals moving under the roadway from ducks to moose. The People’s Way Partnership, Highway 93 in Montana. The People’s Way Partnership is a unique partnership between the Western Transportation Institute at Montana State University, the Confederated Salish & Kootenai Tribes, and Defenders of Wildlife. The mission of the People’s Way Partnership is to effectively communicate the conservation value of wildlife crossing structures that have already been built along U.S. Highway 93 North on the Flathead Indian Reservation, to have the public informed and supportive of wildlife crossing structures in Montana and the nation. North Carolina Dept. of Transportation, Highway 64 in North Carolina. As the department explored re-routing and expanding the capacity on Highway 64 in the 1990’s they incorporated a series of underpasses to mitigate the impact of the roadway and provide safer passage. Washington Dept. of Transportation, Highway 97A Wildlife Fence. As a safety enhancement project, 9-miles of 8-foot tall wildlife fence on the west side of US 97A from Rocky Reach Dam to north of Spencer Canyon (MP 203 to MP 212) in Chelan County. More information is available on the Wenatchee Sportsmen Association’s website. Underpass on Highway 21 in Idaho. Credit: Boise River Wildlife Linkage Partnership. 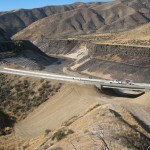 organizations, agencies and individuals working to provide, maintain and establish effective wildlife crossings and other mitigation enhancements through the Warm Springs Avenue and State Highway 21 corridor. Partners include Rocky Mountain Elk Foundation, Ada and Boise Counties, Idaho Dept. of Transportation, Idaho Dept. of Fish and Game, City of Boise, and Bureau of Land Management. The goal of this work is to maintain habitat connectivity and to reduce wildlife-vehicle collisions and the undesirable impacts they have on people, wildlife and other resources the Boise River supports. Washington Dept. of Transportation, I-90 Snoqualmie Pass East Project. A 15-mile stretch of Interstate 90 in Kittitas County is being upgraded to expand capacity, straighten dangerous curves, reduce the risk of avalanches, and provide safer passage for wildlife. The project incorporates both underpasses and overpasses, with an underpass under construction now at Gold Creek.